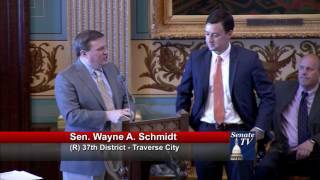 Senator Wayne Schmidt, R-Traverse City, honors Jake Winder for his years of service at the Michigan Senate during the May 19, 2016 session. 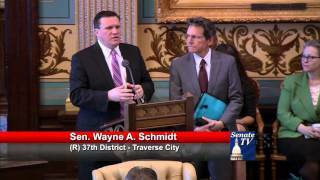 Senator Wayne Schmidt, R-Traverse City, honors John Stephenson at the Michigan Senate during the April 28, 2016 session. 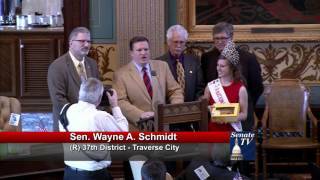 Senator Wayne Schmidt, R-Traverse City, welcomes the National Cherry Queen Danielle Bott to the Michigan Senate during the March 16, 2016 session. 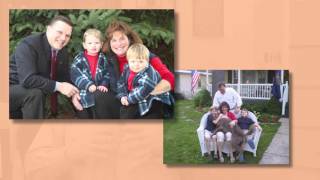 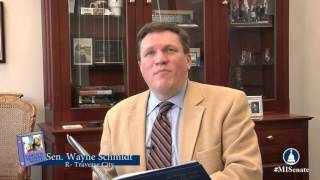 Senator Wayne Schmidt, R-Traverse City, talks about encouraging children to read during March is Reading Month.